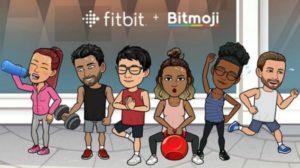 Fitbit and Snap have announced a partnership to make getting active and healthy more fun and motivating, with the first-ever Bitmoji clock face that dynamically updates throughout the day based on your personal health and fitness data, activity, time of day, and weather. It is available for free exclusively for all Fitbit Ionic and Fitbit Versa family of smartwatch users. The Bitmoji smartwatch clock face is a fun, expressive way to depict you living your best life 24/7 – whether it’s logging a yoga sesh, celebrating a goal achievement, or reminding you when it’s time for bed. Carrying an umbrella when there’s a chance of rain so you don’t get caught in a downpour. Sleepwalking when it’s time to catch some Zzs. Since the launch of the Fitbit App Gallery in the fall of 2017, together with its developer community and popular brand app partners like Snap, Fitbit offers access to nearly 3,000 smartwatch apps and clock faces, giving you endless opportunities to personalize your Fitbit smartwatch to fit your unique style and personal goals. Dynamic and data-driven clock faces help keep you accountable by showing your goals and progress front and centre, but having friends in the Fitbit community can also keep you motivated. Fitbit research has shown that users with five or more friends take 819 more steps per day — that’s more than 12 extra miles a month. With the new clock face, your Bitmoji is there on your wrist as a virtual friend who may help motivate you, cheer you on, challenge you to be more active, and celebrate with you when you reach your goals in a fun, new way. The Bitmoji clock face is available now for download in the Fitbit App Gallery on the following Fitbit smartwatches: new Fitbit Versa Lite Edition, Fitbit Versa, Fitbit Versa Special Edition, Fitbit Ionic, and Fitbit Ionic: adidas Edition. Once you download the Bitmoji clock face icon, you will be prompted to connect your Bitmoji account using Snapchat via the Fitbit App settings page.